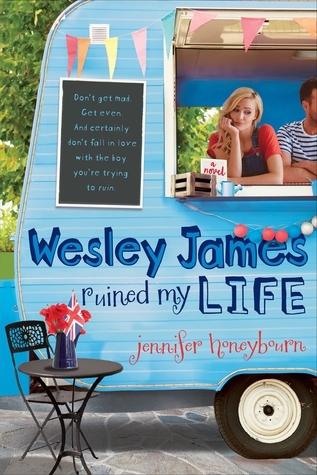 Wesley James Ruined My Life by Jennifer Honeybourn. “Yes, well, that was the plan.” The smile hasn’t slipped from his face, but he won’t meet my eyes. Holding a grudge can be an art form. Or a bad habit. Or a really big misunderstanding. And sometimes it’s a safety blanket and a shield. The protagonist Quinn certainly has the art form part of this down and the other options didn’t just spring to mind out of nowhere either. This was a quick and entertaining read which also touched upon some heavier topics like trust and loss and other family issues. I liked how there wasn’t just the one big thing dominating the whole book but rather a number of things adding up around this one central issue. I forget who said it (and am too lazy to look it up right now) but books have it way harder than real life because they have to be realistic and make sense ... and when does life ever revolve around just one really big plot point? But in contrast to real life I somehow expect these issues to be somewhat resolved by the end of the book in a satisfying and not glossed over manner. So books really have to pass a higher bar than real life. Of course the danger of such a multitude of issues is that in order to fit them into a manageable length something else has to fall by the wayside. In this case I have the feeling that the secondary characters had to carry the brunt of the cut. There are quite a few of them and they all have some really interesting aspects and backgrounds, but they felt a little flat to me. This doesn’t distract from the overall enjoyability of the book, but this is the rare case where I think another 50 or so pages would have done the book a big service in terms of depth and character development. But I also realise that this might not be the ambition and in that case, this really fits the bill of an entertaining, romantic, summery read. Are you someone who holds grudges? I’ll admit that I have been known to do so on occasion (I’m still not over the fact that someone “lost” me in the middle of Alice’s Labyrinth in Disney Land when I was five ... just saying.) Share your teasers (and grudges if you like) in the comments. This sounds like such a fun one! It's on my list. Sounds like it was an interesting book. My Teaser is from Love, Sasquatch, and Other Imaginary Things.